Stir oil with 2 tsp Chinese 5 spice, salt and pepper. 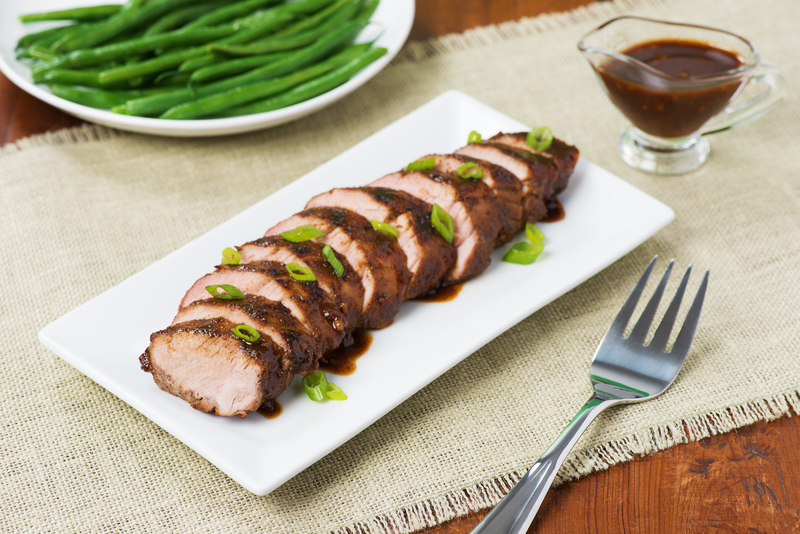 Rub pork tenderloin with spice mixture. Marinate for 15 minutes. Meanwhile bring apricot jam, vinegar, soy sauce, garlic and remaining Chinese 5 spice to a boil in a skillet set over medium-high heat. Stir for 2 to 3 minutes, or until jam is melted and mixture is syrupy. Preheat grill to medium-high. Grease grate well. Grill the pork, turning, for 13 to 15 minutes or until well marked. Continue to grill, basting with apricot glaze, for 4 to 5 minutes or until pork is well glazed and instant read thermometer registers 160°F when inserted into the thickest portion of the tenderloin. Rest for 5 to 10 minutes before slicing. Slice and garnish with green onions.